An expert on the most popular trucks in the world, monster trucks, Tim Kane revisits the current stars of this family-friendly sport and explores how these racing machines have evolved in the past few years. The bodies of these beasts may have slimmed down, but the tires, springs, and shock absorbers have grown, allowing the trucks to soar over obstacles with more spectacular jumps and at much faster speeds. Monster Mega Trucks documents the acrobatic maneuvers and the breathtaking stunts of these oversized vehicles and the derring-do of the monster truck drivers. Readers will enjoy the photos of all the big crashes and how these trucks jump, fly, and weave, often on only one or two wheels, with 1,500-horsepower racing motors. In addition, Kane explores other real-life Transformers that can walk, fly, crawl, and swim. These are true shape-shifting creatures that travel by air, water, and land and perform important tasks, such as eating litter or sucking up oil after a spill. Tim Kane is a reporter and a huge monster truck aficionado. He has worked as a newspaper reporter for more than 25 years, including more than 10 years for the Chicago Tribune. 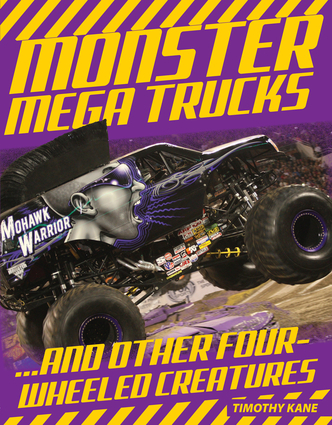 He is the author of Mega Monsters: The Biggest & Baddest Monster Trucks and Monsters on the Move.